Home > The History of Maritime Communication and More! Communication has always been and will certainly continue to be an important aspect of human society. When communication occurs over any amount of distance where face-to-face interaction cannot take place, it is done by telecommunication: communication by electromagnetic or electronic means. 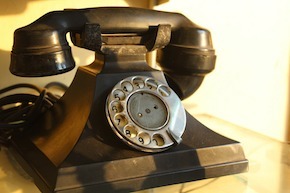 In modern society, telecommunication is commonplace due to advances in technology. We turn on the radio in our car during our commute, we check the mail and email every day, we likely use computers and the Internet at our place of work, we watch online videos and check social media during our leisure time, we sit in front of the TV to wind down, and most of us would never leave the house without our cell phone. But it hasn't always been this easy to communicate over long distances. Prehistoric Era: Fires, Beacons, Smoke Signals, Communication Drums, Horns: Prehistoric communication was very limited. Smoke signals were likely the first form of visual communication, first used along the Great Wall of China. The Greek historian Polybius created a smoke signal system that represented each of the letters of the alphabet to make for more effective communication over a great distance. The messages had to be simple and widely understood in order to be properly conveyed, which limited the amount of communication that could take place. 6th Century B.C. : Mail: Under the rule of Persia's Cyrus the Great, the first mail system was developed. Cyrus could not communicate with everyone in his very large empire, so a system was developed where messengers would travel on horseback to predetermined stops, where they would get on another horse or pass off their messages to the next person to relay the message to its destination. Elsewhere, similar early mail systems were implemented. 5th Century B.C. : Pigeon Post: As their name would suggest, homing pigeons are known for their innate ability to return to their nest even if taken a long distance away. Because of this, people began to attach messages to homing pigeons as a means of communication. 4th century B.C. : Hydraulic Semaphore: In ancient Greece, a form of communication was invented that involved identical unconnected containers of water on separate hills. Vertical rods were in each container. In order to communicate, someone on one hill would have to send a signal to the person on the other using a torch. Both parties would then open the spigot at the bottom of their respective container and water would be drained. When the signal sender lowered his torch, then both people would close the spigots and the water level would convey a message at a certain point on the rod. 490 B.C. : Heliographs (Shield Signals): A heliograph used the sun in order to communicate. Surfaces such as mirrors and shields were used to reflect light. This was a difficult form of communication due to the fact that it was reliant on good weather and daylight. While it was possible to use heliographs in less ideal weather and even at night, it would limit the distance that communication would be possible. 15th Century A.D.: Maritime Flag Semaphore: Since it was difficult to communicate between ships or between a ship and land, flag signals were created, with each position meaning a different letter or signal. To this day, flag signals are still in use. 1672: First Experimental Acoustic (Mechanical) Telephone: The first experimental telephone was created by Robert Hooke. He discovered that sound could travel between earpieces using a wire or string. It functioned much like the string and soup-can telephones that kids make to communicate with a friend in the next house over. 1790: Semaphore Lines (Optical Telegraphs): Much like hydraulic semaphores and flag semaphores, semaphore lines used a visual aid in order to communicate. Semaphore lines conveyed information by using movable blades or paddles on top of a tower or other structure that conveyed a message when in a fixed position. 1867: Signal Lamps: Vice Admiral Philip Columb of Britain invented communication by means of a signal lamp. Although Morse code had not been officially adopted yet, Columb devised a series of dots and dashes that were used to communicate between ships. 1877: Acoustic Phonograph: The phonograph is attributed to Thomas Edison. With this technology, sound could be recorded for later playback. It worked by creating grooves in a tinfoil sheet, which could be listened to at a later time, albeit very faintly. This led to the first record player. 1838: The Electrical Telegraph: Samuel Morse and his friends made an attempt to record using a telegraph and soon discovered that communication could be achieved between two telegraphs by holding and pressing a button in a series of intervals. In order to make communication effective and worthwhile, Morse developed his own code, known today as Morse code. 1858: First Transatlantic Telegraph Cable: At this point, those living in the United States were able to communicate with others within their own country, assuming both parties had access to a telegraph, and the same was true of those living in England. However, until 1858, no one was able to communicate with those outside of their country by telegraph. Cyrus Field laid the first transatlantic telegraph cable and was able to connect the two countries for international telegraph communication. 1876: Telephone: As telegraph communication began to grow, technological advances led to a need for more effective telecommunication. A goal had by many at the time was to be able to send multiple messages using a single telegraph wire. While trying to achieve this goal, the telephone was invented in 1876. The Bell Telephone: Patent Nonsense? 1880: Telephony via Light-Beam Photophone: Alexander Graham Bell, widely credited with inventing the telephone, also invented light-beam photophones. Using the money he had earned from the invention of the telephone, he went to work on making improvements on it and discovered a way to transmit sound using beams of light instead of wires. 1893: Wireless Telegraphy: Wireless telegraphy, also known as radiotelegraphy, was the first step into the world of radio communication. The first wireless telegraph was invented by Nikola Tesla, and instead of using wires to communicate, it worked via electromagnetic waves that were transmitted between telegraphs. 1896: Radio: The first radio signals were transmitted in 1896 by Guglielmo Marconi, though the sounds only traveled about a mile. Still, the possibility of transmitting radio waves held so much potential. About two years later, the first radio broadcast was made by Marconi by broadcasting the results of a sporting event to the office of a local newspaper. 1914: First North American Transcontinental Telephone Calling: Although symbolically, Alexander Graham Bell calling his San Francisco-based assistant from New York is recorded as the first North American transcontinental phone call for the history books, it was actually tested about six months earlier, in the summer of 1914. 1927: Television: Among all of the advances in transmitting sound, 21-year-old Philo Farnsworth wanted to create a system that could capture moving images and transmit them to other devices. The first image transmitted by means of the television was a single line. 1927: First Commercial Radio-Telephone Service, U.K.-U.S.: In January of 1927, a little less than a year after the first transatlantic telephone call was made, it was implemented for commercial use. There were some issues along the way, such as fading and interference, not to mention the very high cost. 1930: First Experimental Videophones: With great success in transmitting audio and video, in 1930, AT&T combined them by using the early technology of the television and proven methods of transmitting audio. 1934: First Commercial Radio-Telephone Service, U.S.-Japan: Now that communication across the Atlantic Ocean had become more commonplace, it was time to communicate over the Pacific Ocean. Because of the great distance, some of the problems that had come up with the first transatlantic telephone calls repeated themselves, namely radio interference and high cost. 1936: World's First Public Videophone Network: The first public videophone network was set up at a trade fair in Nazi Germany. Needless to say, its use was limited to people of Aryan descent. 1946: Limited-Capacity Mobile Telephone Service for Automobiles: The first call from a car was made in the summer of 1946. Since these bulky phones were expensive to install and most people deemed them to be unnecessary, not a lot of people had them. 1956: Transatlantic Telephone Cable: To reduce the cost of transatlantic phone calls, a 36-circuit wire was installed stretching from Newfoundland to Scotland. 1962: Commercial Telecommunications Satellite: In 1962, the Commercial Telecommunications Satellite Act was passed, allowing satellites to be sent into space to aid in telecommunications worldwide. 1964: Fiber-Optic Telecommunications: Fiber-optic telecommunications brought back Bell's idea of using light waves to assist in telecommunications. Fiber-optic communications were better for communication over long distances due to less loss in signal strength compared to metal wires. 1965: First North American Public Videophone Network: The videophone had been in development for decades by the time it was finally released to the public in North America. Despite all of the time, research, and effort that went into its development, it never found a market among the general public. 1969: Computer Networking: The Advanced Research Projects Agency Network, or ARPANET, was one of the first foundations of the Internet. The first successful message was transmitted in October of 1969, which was simply the word "login." By December of 1969, four connections were made on the ARPANET. 1973: First Modern-Era Mobile (Cellular) Phone: The first cell phone call took place between Martin Cooper and his rival, Joel Engel, who worked at AT&T. Cooper simply told Engel that he was calling from a real cell phone. Although the first cell phone was a huge deal, it wasn't ready for the general public just yet: It was unreasonably big for daily use, and it took 10 hours to recharge after only half an hour of use. 1979: INMARSAT Ship-to-Shore Satellite Communications: Since satellite use had been made permissible in 1962, it allowed for safe ship-to-shore communication for seamen and ship passengers who happened to need to communicate with someone on land. 1981: First Mobile (Cellular) Phone Network: The first cell phone network was launched in 1979 in Tokyo, Japan, and by 1981, it had expanded throughout the country. Meanwhile, communication improved in Denmark, Finland, Norway, and Sweden by means of the Nordic Mobile Telephone system. 1982: SMTP Email: As more computers were being connected by means of ARPANET, interest increased in finding ways to communicate with one another. Simple Mail Transfer Protocol, or SMTP, email was first implemented in 1982 by Jon Postel. 1983: Internet: The Internet officially came into existence on Jan. 1, 1983. While ARPANET had made it possible to transmit data between multiple computers on the same network, switching from its previous network protocols to Internet Protocol (IP) allowed for researchers to assemble a "network of networks" to compile what we now know as today's Internet. 1998: Mobile Satellite Hand-Held Phones: A company called Iridium launches a satellite phone network, allowing people all over the world to make phone calls from anywhere, whether or not a working cellular network is present there. While this technology is still useful in far-flung locations or during disasters when cell networks don't work, by the time Iridium launched its product, cell phones were widely available and much cheaper, and sales could not make up for the massive investment they had made to get their system up and running. 2003: VoIP Internet Telephony: Voice over Internet Protocol, or VoIP, is a relatively recent technology that has made calling over long distances affordable for almost everyone in the world. The Invention of Radio Technology: This page focuses on the invention and uses of the radio, particularly mobile radio. What Is Ham Radio? Amateur radio broadcasting can be used for fun and educational purposes. Edison's Sound Recordings: Listen to some of the earliest recordings ever made courtesy of the Thomas Edison National Historical Park. History of Television: Read a brief history of television, its invention, and how it has come into use in modern-day communication and broadcasting. Television Invention Timeline: Learn about the major events in the television's invention and history. Computing History Timeline: This timeline details all major advancements in computing. Internet History Timeline: Read the history of the Internet from ARPANET to the World Wide Web. The History and Evolution of Cell Phones: This link provides a modern history of how telephones are continuing to change and evolve in the modern era. The History of Social Media: Today, phones are much more than just phones; smartphones allow us to connect in multiple ways, including through social media.